Only four kilometres from the CBD and easily accessible by boat up the river, Toowong was one of the first villages to be established outside Brisbane. An early settler in the area, Richard Drew, first proclaimed Toowong as the name of the village around 1862 - it was named after the call of a local bird. 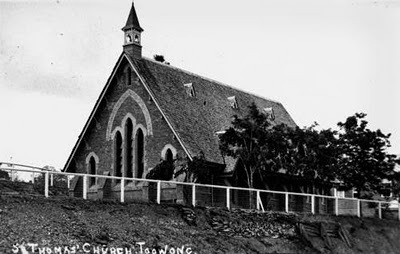 By 1865, settlers in Toowong decided that they needed a church, and they raised £150 to construct a Church of England. The aforementioned Richard Drew donated some land in Curlew St (on the other side of Moggill Rd to the current building) and the first church and school were built there, being completed in 1866. At that time, the church formed part of the Brisbane parish of All Saints' Church. In 1870, the parish of St Thomas' separated from All Saints', and as the congregation was growing, one of the first orders of business would be to build a bigger church. The Church of England was able to acquire appropriate land in Toowong's High St from the Cribb family in 1876. A foundation stone was laid in early 1877, and the new church, designed by parishioner and well-known architect Mr FDG Stanley, was officially opened in October 1877. The photograph of it (above) was taken in 1923. Another Anglican church that Stanley designed about the same time was the Holy Trinity in Fortitude Valley. The church today (above) can still be found at the intersection of High St and Jephson St at the start of Moggill Rd. The gardens have grown, preventing a photograph from High St as the original was taken, so I have adjusted the angle slightly.